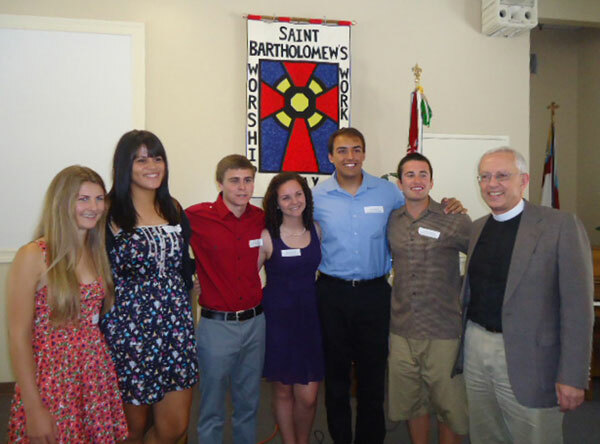 All scholars were active members of St. Bartholomew's and contributed to many noteworthy service organizations, both locally and internationally. Pictured below (from left) are Kara Jones, Lucille C. Heide Memorial Scholarship; Courtney Jackson, WSB Scholarship; Philip Cowart and Brooke Stark, Brittany K. Stark Memorial Scholarship; Neil Dalvie, Lucille C. Heide Memorial Scholarship; Aaron Shapiro, WSB Scholarship and Father Fred Thayer. The Women of St. Bartholomew’s have donated scholarships annually to local students and women for the past fourteen years with proceeds from the St. Bart's Thrift Shop in the Carriage Center in Poway.